This Orgone device is not only unique and unusual cteation, but it is also a high vibrational device that will protect you from EMF radiation, will help in balancing and harmonizing energies, while connecting mind, body and spirit as one, activating your Chi channels and clearing all the negative energy in your body and around you. It will bring love, awareness and luck into your life. Symbol of the realm of emotions, invitation to dive deeper into your feeling; Being on the lookout for illusions and deceits, whether are external or personal; Connection with nature’s spirits, fairies realms. Symbol of metamorphosis and transformation, it inspires those who have it as a totem to bring about the changes needed in their lives in order to go to reach their full potential. When this spirit animal shows up in your life, it’s an indication that it’s time for change. 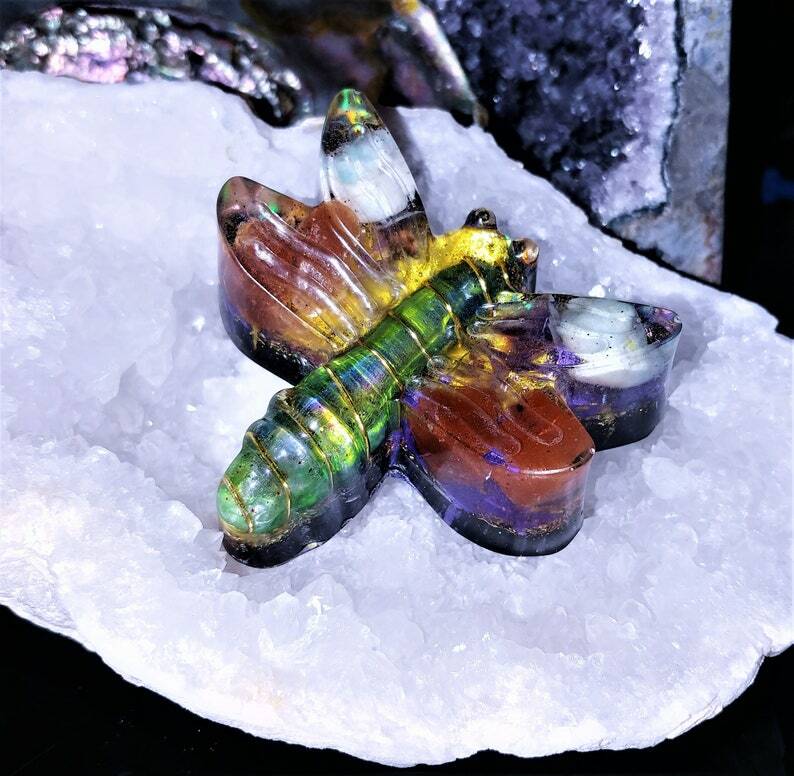 Just like the dragonfly changes colors as it matures, you may be called to live and experience yourself differently. Stay open to the enfoldment of your personal journey. Dragonflies are powerful allies to connect with the spirit of nature. Their fairy-like quality makes them auspicious spirit animals to work with the power of light and fairy realms. It contains Apple Aura Quartz wrapped in copper wire for better conductivity, Fluorite, Amazonite, Red Calcite, Shungite powder, Sage Rose Petals, Mica Flakes, 24 K gold flakes, copper flakes, Metal shavings, Copper coil, Black Sun Iron Oxide nano powder, highest jewelry grade epoxy resin. All the crystals used in it were cleared in ocean water, charged on sun light and moon light, and enhanced with the power of Divine Reiki Energy. It was also treated to vibration of Love and Light ~ 528 hz~ while curing. This clear Quartz displays a fresh, yellow-green color reminiscent of a Granny Smith or Golden Delicious. This healthy crystal is a protector of the spleen, the organ responsible for purifying the blood and boosting the immune system. Worn over the base of the sternum or taped over the Spleen Chakra, it fights energy drains and overcomes psychic vampirism. It assists in severing ties with previous partners or mentors who retain a mental or emotional hold despite physical separation. It is highly beneficial in multidimensional and cellular memory healing, and is an efficient receptor for programming and bringing the body into balance. Clear Quartz is known as the stone of power and amplifies any energy or intention. Clear Quartz protects against negativity, attunes to your higher self, and relieves pain. Clear Quartz has been shown to enhance and strengthen the aura. Clear Quartz comes to us with information for the higher self to assimilate in the process of one's spiritual growth. It is often used to cleanse, open, activate, and align all of the chakras. In natural form, Clear Quartz Points radiate their energies outward, into the surrounding environment. Clear Quartz can be programmed with intention and kept in a central place to emit its helpful energies. The Sacred Geometry of a 6-sided Clear Quartz Point contributes to its ability to magnify energetic vibrations. This gemstone is an excellent tool for meditation, crystal therapy, and chakra energy balancing. Fluorite gem placed between your eyebrows can help you connect with the higher levels of creative expression and balance your mind. This stone works on the mental level by amplifying our thought processes. It can be used to increase the ability to focus and concentrate, and some people have experienced increase in the intellectual development after regular use. From this we can conclude that fluorite properties are related to the spheres of the mind and spirit. Its accentuated mental influences help in our quick organization and processing of information. It brightens our mental capabilities, our stability and clarity. It absorbs negative energies from our environment, cleanses the aura and the chakras, at the same time protecting us from psychic manipulations. Pink and purple fluorite stimulate the third eye, bringing wisdom and power of discrimination. Purple fluorite enhances the mystical states of consciousness, and can promote spiritual vision. It is useful for the bones, bone marrow, and the spine. Red Calcite increases your energy, uplifts emotions, increases willpower and opens and heals the base and heart chakras. It removes stagnant energy, which includes constipation both physical and mental and dissolves blockages. Red calcite removes fear and gently brings understanding of the source. It will heal hip and lower limb problems by loosening tight joints, easing arthritis and rheumatism. On a more subtle level red calcite will remove blockages that prevent you from stepping into the unknown and move toward your future.